Every flying thing, whether it’s an airplane, spacecraft, soccer ball, or flying kid, experiences four aerodynamic primary forces: lift, weight, thrust and drag. An airplane uses a propeller or jet engine to generate thrust. The wings to create lift. The smooth, pencil-thin shape minimizes drag. And the molecules that make up the airplane attributes to the weight. 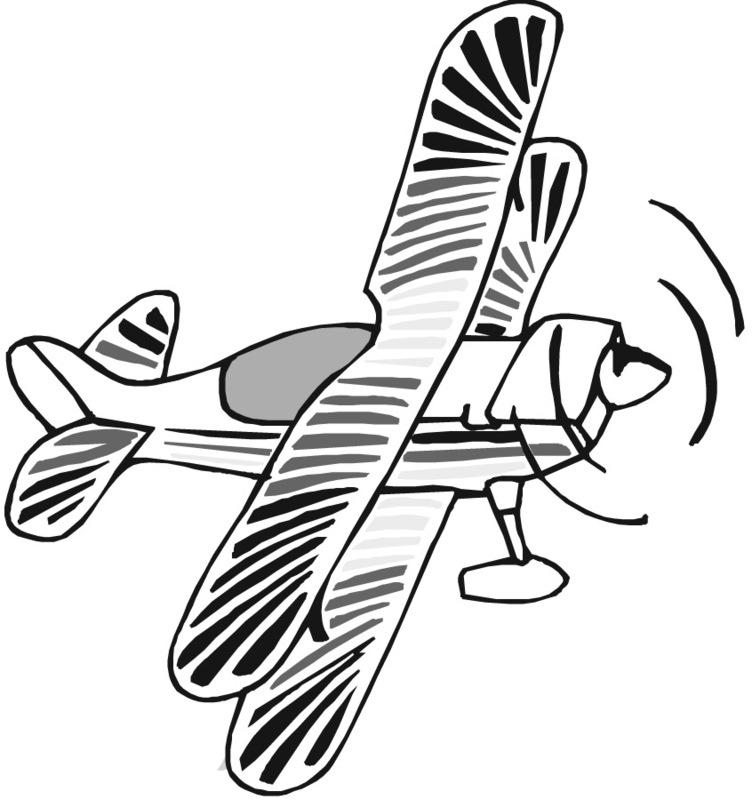 Take the balsa wood airplane and try to fly just the body (no wings or fins). It flips all over the place. Try flying just the large wing (no body). Somersaults! Now slide the large wing into the body and fly (fewer somersaults, but still sickening to fly in!). 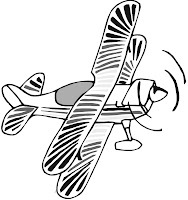 Now add a horizontal stabilizer (elevator) tail, and when you throw it, add a slight curve so the plane “fishtails” in the air (like a car)… but did you notice that there are no more somersaults? Add the vertical tail (rudder) and see how it now steers straight no matter how to curve-throw it. Helicopters. Cut out a paper rectangle 5 by 2 inches. Cut lengthwise down the strip, stopping about an inch before the end. Tape this uncut inch to the end tip of a popsicle stick. Fold the “bunny-ear” flaps down in opposite directions. Throw off a balcony and watch it whirl and gyrate! Optional: You can notch the end of the popsicle stick to make a sling-shot helicopter. Make a quick slingshot launcher by looping a rubber band to another popsicle stick end. Butterfly Cups. Tape two Dixie paper cups together, bottom-to-bottom. Chain together six rubber bands. Loop one end of the rubber band chain over your thumb and hold your arm out horizontally straight, palm up. Drape the remainder of the chain along your arm. Place the taped butterfly cups at the free end (near your shoulder) and slowly wind the rubber bands around the middle section of the cups. When you wind near the end, stop, stretch the chain back toward your elbow, make sure the rubber band comes from the underside of the cups and release. The cups should rotate quickly and take air, then gracefully descend down for a light landing. Try making one with four cups. Hot Air Balloons. Shake out a garbage bag to its maximum capacity. Tape (use duct or masking tape) the open end almost-closed… you still want a small hole the size of the hair dryer nozzle. Use the hair dryer to inflate the bag and heat the air inside (make sure you don’t melt the bag). When the air is at its warmest, release your hold on the bag while you switch off the hair dryer. It should float up to the ceiling and stay there for a while. This experiment works best on cold mornings. The greater the temperature difference between the bag’s air and the surrounding air, the longer it will float. Parachutes. Attach a piece of floss or thin string to the four corners of a tissue. Attach a stick, a small wad of stones wrapped in another tissue, a pinecone, etc. to the centers of the string. Practice dropping these from the balcony and see which falls slowest with which load. Ring Thing. Cut an index card into thirds lengthwise. Loop one strip into a circle and tape ends together. Place two remaining strips together end-to-end and tape, then loop into large circle and tape in place. Place a piece of tape across one end of a straw and gently secure one ring to the tape. Repeat on the other end with remaining ring. Make sure the two rings are concentric (you can see through both like a telescope). Throw it small-end-first! Free Form Machines. Make an obstacle course with some or all the following different challenges: Hit a target balloon (arm the machines with opened paper clips); Go over and under a suspended length of string; Make it through a hula hoop suspended vertically or horizontally; Carry a jelly bean passenger safely across shark-infested waters (two tables spread apart); Dangle large paper airplanes (made from 11×17″ paper, or two 8.5×11″ papers taped together to make an 11×17″) from the ceiling for a ‘dogfight’ to earn points if you tag one; Shoot through the basketball hoop, and dive into a basket. About the Author: As a teacher, homeschool science teacher, engineer and university instructor Aurora Lipper has been helping kids learn science for over a decade. Editor’s Note: Some of the experiments mentioned in this article are actually activities. To turn an activity into an experiment, be sure to incorporate the scientific method by making a hypothesis about what will happen, conducting the experiment, recording the results, analyzing the results, drawing a conclusion, and, for older children, making a report.